It’s the Christmas season in Nashville but a few people aren’t feeling joy, peace, or goodwill towards men. Greg and Jill McKenzie, husband and wife, are partners in McKenzie Investigations. The company has been hired by a local attorney to investigate a group that seeks to bring an NBA basketball team to Nashville. McKenzie’s client represents a group that feels the NBA promoters are not on the up and up. The client also feels that there is just not room in Nashville to support both pro hockey and pro basketball. The investigation is barely underway when Greg receives a phone call from Arnold Wechsel. Arnold asks Greg to meet him because he has important information for him. When Greg questions Arnold, he will only say it is about the National Basketball Assoication matter. Greg goes alone to the meeting place as requested but finds Arnold's body but is too late to help Arnold. The first officer to arrive on the scene is not fond of Greg and suggests he might have something to do with the murder. Greg and Jill soon realize that what they assumed would be a simple investigation is quickly turning into a situation where their own lives are put in danger. To add to the mix a man that Greg helped send to prison is on the loose in Nashville and doing his best to make Greg’s life miserable. Chester D. Campbell has written four previous Greg McKenzie mysteries. 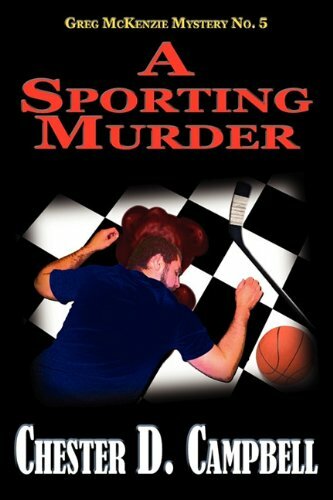 There is plenty of suspense and excitement to be found in the McKenzie mysteries and "A Sporting Murder” is no exception. It is also a pleasant experience to read about a couple that works so well together both in their marriage and in their business dealings.